Special Olympics Ontario would like to thank the GoodLife Kids Foundation for supporting the pahl Step Into Action program. Their generous funding support will assist Step Into Action with its continued growth and development by increasing the number of elementary school students (aged 7-14) participating in the program. The purpose of targeting this demographic is to not only change their perceptions and behaviour towards physical activity, but also connecting students, parents and teachers to Special Olympics Ontario. Typically, students, parents and teachers at the elementary level are not aware of the programs and services offered by Special Olympics Ontario for youth. Step Into Action enables Special Olympics Ontario to engage an entirely new demographic who otherwise may not have heard about the organization. pahl’s Preparing to Compete Workbook has been updated and is now available online! This is a perfect tool for athletes leading up to the Canada Winter Games in St. Albert and the Ontario Provincial Spring Games in Kingston. The workbook provides checklists, useful health tips, inspiring quotes and a goal setting guide to help athletes focus on being positive and confident in their ability. To download and read the full document, please click on the following link: pahl Preparing to Compete. pahl Nutrition Guide Now Available! Special Olympics Kingston Spring Games Polar Bear Plunge! On February 5, over 100 participants took part in the Special Olympics Polar Bear plunge in Kingston, Ontario to raise money for the upcoming Provincial Spring Games. The plunge raised $35,315.40, the highest amount ever raised in Canada for a Polar Bear Plunge! Our athletes are certainly lucky to have such great supporters and sponsors! The Spring Games will take place from May 31 – June 3 in Kingston, Ontario. For more Games information, visit the Kingston 2012 website at http://www.specialolympics2012games.com/. Oshawa – On November 23, 2011, 205 students and 95 educators from across the Durham District School Board (DDSB) were among the first in the province to participate in Special Olympics Ontario’s brand new “Step into Action” program, which was launched at Maxwell Heights Secondary School. 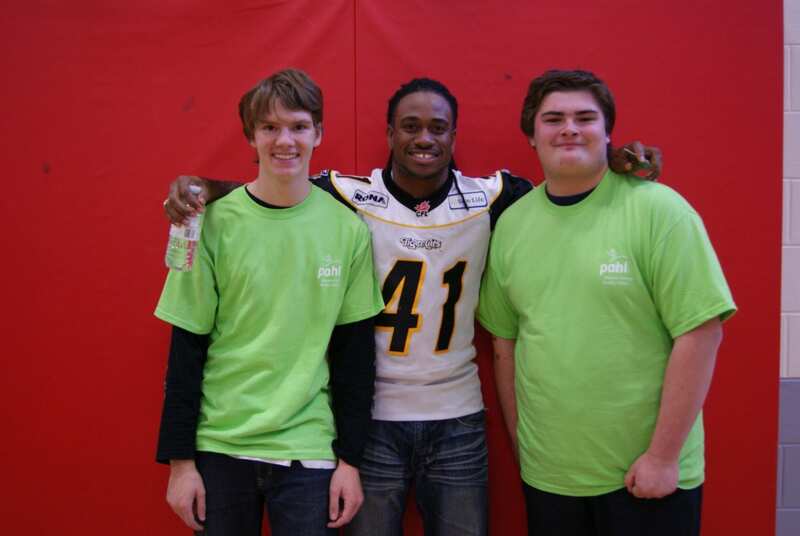 Students from 14 secondary schools across the DDSB participated in the Launch event, which featured dancing, music, group fitness and motivational words from Hamilton Tiger Cats defensive back Jonathan Hood. The new program is part of Special Olympics Ontario’s Physical Activity and Healthy Living (PAHL) program, which was created to help those with an intellectual disability take action to become healthier and stay more physically fit. DDSB is proud partner in piloting the program for students with intellectual disabilities, said Doug Crichton, DDSB’s Superintendent of Education / Special Education. “Step into Action provides our high school students with intellectual disabilities with the opportunity to improve their fitness and increase their understanding of how to stay active and healthy,” Mr. Crichton said. “The program allows them to track their efforts, learn and have fun at the same time.” The new program is an interactive web based tracking program designed to increase the physical activity levels of athletes and students by taking a ‘Step’ challenge. The ‘Step’ component of the program includes any type of activity that can be measured by a pedometer. The program encourages participants to “step” 30 minutes a day, increasing their duration and intensity on a weekly basis. Also, on the program website (step.specialolympisontario.com), students and teachers can find resources on goal-setting, nutrition and physical fitness. 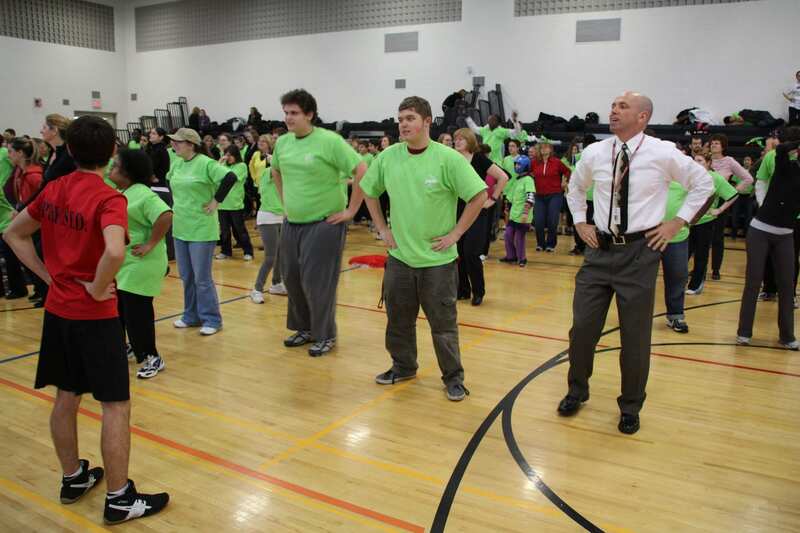 Program leaders, including school staff, who register for the program are provided with pedometers and resources through Special Olympics Ontario. It’s a good way to encourage students to make healthy habits, said Board Chairman Larry Jacula, who was on hand for the event. “This program will encourage students not only to start along the path of a healthier lifestyle, but also fosters development in terms of goal achievement and computer literacy,” Mr. Jacula said. Daily fitness is an important part of Maxwell Height’s student Kalin Matheson’s routine. The 17-year-old was both a leader during the kick-off event, and is a participant in the program. Good music and energetic exercise make this program something she enjoys, she said.